Definition at line 158 of file DisassemblerTypes.h. Definition at line 131 of file DisassemblerTypes.h. Definition at line 137 of file DisassemblerTypes.h. Definition at line 129 of file DisassemblerTypes.h. Definition at line 135 of file DisassemblerTypes.h. Definition at line 133 of file DisassemblerTypes.h. Definition at line 124 of file DisassemblerTypes.h. Referenced by llvm::AArch64ExternalSymbolizer::tryAddingSymbolicOperand(), and llvm::MCExternalSymbolizer::tryAddingSymbolicOperand(). Definition at line 126 of file DisassemblerTypes.h. The reference types on input and output. Definition at line 121 of file DisassemblerTypes.h. Definition at line 144 of file DisassemblerTypes.h. Referenced by llvm::MCExternalSymbolizer::tryAddingPcLoadReferenceComment(), and llvm::AArch64ExternalSymbolizer::tryAddingSymbolicOperand(). Definition at line 142 of file DisassemblerTypes.h. Definition at line 147 of file DisassemblerTypes.h. Definition at line 155 of file DisassemblerTypes.h. Definition at line 149 of file DisassemblerTypes.h. Referenced by llvm::MCExternalSymbolizer::tryAddingPcLoadReferenceComment(), llvm::AArch64ExternalSymbolizer::tryAddingSymbolicOperand(), and llvm::MCExternalSymbolizer::tryAddingSymbolicOperand(). Definition at line 151 of file DisassemblerTypes.h. Definition at line 153 of file DisassemblerTypes.h. Definition at line 140 of file DisassemblerTypes.h. 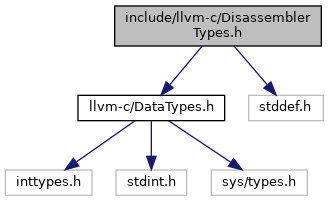 Definition at line 95 of file DisassemblerTypes.h. Definition at line 96 of file DisassemblerTypes.h. Definition at line 93 of file DisassemblerTypes.h. Definition at line 94 of file DisassemblerTypes.h. Definition at line 98 of file DisassemblerTypes.h. Definition at line 97 of file DisassemblerTypes.h. Definition at line 87 of file DisassemblerTypes.h. Definition at line 88 of file DisassemblerTypes.h. The operand VariantKinds for symbolic disassembly. Definition at line 82 of file DisassemblerTypes.h. Referenced by llvm::MCRelocationInfo::createExprForCAPIVariantKind(), and getVariant(). An opaque reference to a disassembler context. Definition at line 23 of file DisassemblerTypes.h. The type for the operand information call back function. This is called to get the symbolic information for an operand of an instruction. Typically this is from the relocation information, symbol table, etc. That block of information is saved when the disassembler context is created and passed to the call back in the DisInfo parameter. The instruction containing operand is at the PC parameter. For some instruction sets, there can be more than one operand with symbolic information. To determine the symbolic operand information for each operand, the bytes for the specific operand in the instruction are specified by the Offset parameter and its byte widith is the size parameter. For instructions sets with fixed widths and one symbolic operand per instruction, the Offset parameter will be zero and Size parameter will be the instruction width. The information is returned in TagBuf and is Triple specific with its specific information defined by the value of TagType for that Triple. If symbolic information is returned the function returns 1, otherwise it returns 0. Definition at line 42 of file DisassemblerTypes.h. The type for the symbol lookup function. This may be called by the disassembler for things like adding a comment for a PC plus a constant offset load instruction to use a symbol name instead of a load address value. It is passed the block information is saved when the disassembler context is created and the ReferenceValue to look up as a symbol. If no symbol is found for the ReferenceValue NULL is returned. The ReferenceType of the instruction is passed indirectly as is the PC of the instruction in ReferencePC. If the output reference can be determined its type is returned indirectly in ReferenceType along with ReferenceName if any, or that is set to NULL. Definition at line 112 of file DisassemblerTypes.h.